A rocky economy could adversely affect newborns, according to new research from the University of California at Berkeley published inthe November issue of the journal Epidemiology. Researchers found that if the economy was a worse than expected in the state where mothers resided during the first trimester of their pregnancies, their babies averaged 3.7% smaller compared to others of the same gestational age. The study looked at a sample of more than 6,700 U.S. births between 1982 and 2000, and also examined differences by the mother's education level, race/ethnicity, employment and poverty status. The findings are significant because evidence increasingly suggests that fetal growth is an important predictor of health later in life, says Claire Margerison-Zilko, Ph.D., one of the study's researchers, and a postdoctoral fellow with the Center for Social Work Research at the University of Texas-Austin. 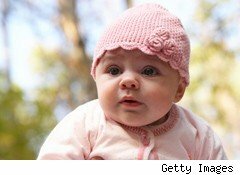 Babies born smaller than the norm have an increased risk of neonatal and infant morbidity and mortality, she says. Later in life, they face an increased risk for obesity, diabetes and heart disease. The babies most at risk for lower birthweight were those born to women of lower education, and to mothers who didn't work outside the home. Margerison-Zilko had hypothesized that race and ethnicity would be bigger factors. For now, says Margerison-Zilko, researchers can't pinpoint the mechanisms behind this association, "But we can speculate that the relationship may be due to maternal behavior change or psychosocial stress during economic contractions." The discovery that the association between the economy and birth weight is strongest in the first trimester could be driven by processes that affect early fetal growth, a more active maternal stress response in early pregnancy, or a longer time frame being necessary for exposure to affect maternal behavior or physiology, she surmises. What's the takeaway? The health of the youngest members of our society is at stake in how we respond to our economic troubles. Says Margerison-Zilko,"Vulnerable women need additional support and resources during times of economic stress."